Welcomes United States sports and horse racing bettors. No download. 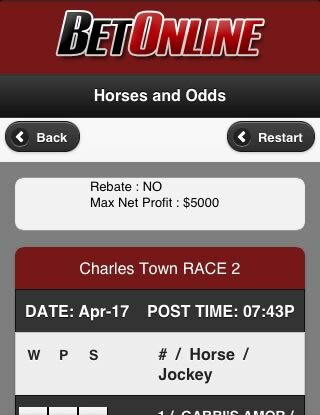 ​Only U.S. friendly mobile racebook. 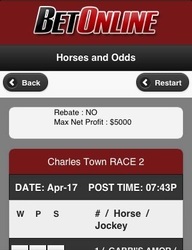 Bet on horse racing from your phone. ​Bitcoin friendly sports betting app. Make a deposit or payout with bitcoin. ​﻿Bet Online has been around since 2001, but in recent years the online sportsbook has become one of the premier online bookmakers on the web, especially for American citizens. They recently began to offer a mobile betting platform to all their customers. Players can use the mobile betting site on their Android, iPhone and iPad and through any other internet connected mobile devices. There is no download required to use the app. Bet Online originally operated as Best Line Sports, changing their name to Bet Online after acquiring the BetOnline.com domain name and the existing sportsbook. They rebranded the whole company into BetOnline and have slowly become one of the major players in online sports betting. They currently operate on BetOnine.ag and BetOnline.com redirects traffic to their new site. BetOnline has a base of operations in Panama City, Panama and has dual licenses in both Panama and Antigua. In addition to offering an online sportsbook, Bet Online offers players an online casino and poker room. However, neither of these are yet available for mobile use. Like many sportsbooks for United States punters, BetOnline does not have the most advanced platform for mobile betting. However, it still offers more than enough features for players and most importantly is a stable and security betting platform. After logging into the mobile site, players will be able to choose from a list of wager types, such as straight bets, parlays, teasers, props, futures and more. After choosing their type of wager, bettors will be able to choose from BetOnline’s full list of betting markets which feature the full arsenal of bets that are available on the main site. Bettors will be able to view current promotions on BetOnline’s mobile application along with email and phone listings for support. They will also be able to deposit via the mobile application. Once again, the full slate of deposit options is available for betting, including credit cards, person to person transfers, e-wallets, bank wire and sportsbook to sportsbook transfer. Some of these methods, such as credit card will be instantly credited, but others will take several hours or several business days to process. 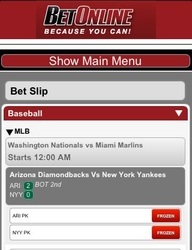 Bet Online’s mobile site is essentially a scaled down version of the main site. Color schemes are similar, along with the interface. In our opinion, this is a plus as bettors will be familiar with the mobile platform since they have used the main betting interface at BetOnline.ag. It’s a basic betting platform with no frills and no nonsense. The true test of an application is how it runs and is it stable. 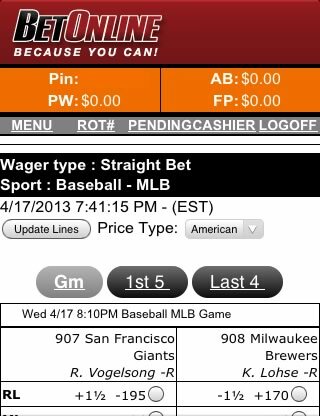 In this category, BetOnline passes with flying colors. Clicking between betting types and selections is nearly instant and the mobile site is straightforward and user-friendly. Could it look a more advanced and offer bettors a bit more? Sure, but in its current form, it more than does the job. Bonuses and promotions are one of Bet Online’s specialties. Bet Online offers bettors a life time deposit bonus. Yes, that’s correct. On any deposit made, bettors can redeem a 15 to 25% bonus in the form of a Free Bet. This promotion is especially lucrative because it is good up to $900. Bet Online also offers many seasonal promotions, including chances to earn Free Bet Bonuses with an extensive amount of year round offers. 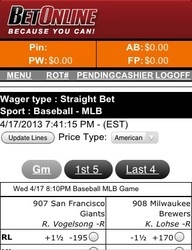 Bet Online has a wide variety of wagering opportunities. The sportsbook is mostly US focused, so players will have a large assortment of player and team props for many high profile games and events. Aside from offer plenty of betting options for Basketball, Football, Baseball and Hockey – Bet Online has betting markets for nearly every sport in the world. Boxing, Racing, Cricket, Darts, Golf, Mixed Martial Arts, Ruby and many more sports are available to bet. Soccer bettors will be happy to see a long list of domestic leagues and international competitions available for betting, as well. 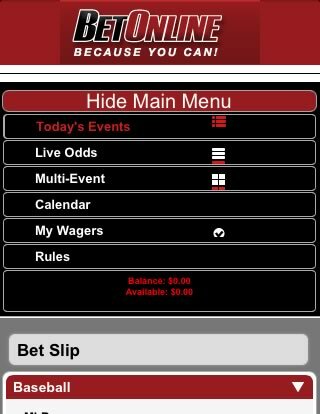 BetOnline's mobile client also allows users to place bets on any United States horse races. If you are based in the United States and you want to place a bet from your phone, BetOnline is currently your only option. Bet Online’s mobile betting application is a much needed addition for bettors who want to wager on the go and is a good step in the right direction for US sportsbook’s mobile apps. 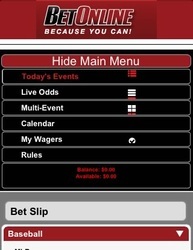 Adding this convenience to an already enormous betting menu makes Bet Online one of the top choices for sports bettors.